A scientist seeks to evaluate the role of angiotensin II in changing GFR, RPF and FF. In the presence of angiotensin II, how will these measurements change? Angiotensin II constricts efferent arteriole so that less blood enters the glomerulus while pressure raises, leading to elevated GFR. Thus, FF is elevated too. Angiotensin constricts efferent arterioles leading to inc GFR and dec RPF. FF=GFR/RPF, so FF inc.
Inc GFR, Dec RPF and inc FF! The powerful vasoconstrictor angiotensin II preferentially constricts efferent arterioles. 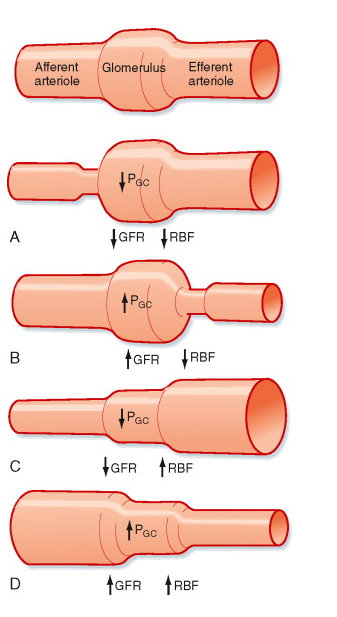 This constriction will increase GFR but will decrease RPF. Since FF = GFR/RPF, FF will also increase. Patients taking ACE inhibitors or angiotensin II receptor blockers will abolish this effect and will have a decreased GFR. Last edited by alaahoda2001; 09-04-2011 at 02:35 PM. hey i think that we r dilating efferent only in picture c and dilating afferent in d.. am i right? Last edited by alaahoda2001; 09-05-2011 at 12:36 AM. A must know concept for usmle! Know it well and It'll get you many answers right! Remember, FF is a percentage of RPF and not an absolute value...so even if the GFR stays the same, since the denominator decreases, the percentage must increase! But then read one more time and realized that the answer is D.
Renin is released by juxtamedulary cells of the kidney in response to decreased Na... so, logically to increase the delivery of Na to Juxtamedullary cells renin is released and converted to Angiotesin and then to Angiotensin 2 to constrict (mainly efferent arteriole) and all other arterioles too, but efferent especially, so GFR will increase, RPF will go down and FF will increase. i really want to know what do you think? So, here we have the effect of AII: "preserve GFR & RPF decreases"
Does this mean I should stop trusting Kaplan or what? "Angiotensin II Constricts Efferent Arterioles. A powerful renal vasoconstrictor, angiotensin II, can be considered a circulating hormone as well as a locally produced autacoid because it is formed in the kidneys as well as in the systemic circulation. Because angiotensin II preferentially constricts efferent arterioles, increased angiotensin II levels raise glomerular hydrostatic pressure while reducing renal blood flow. It should be kept in mind that increased angiotensin II formation usually occurs in circumstances associated with decreased arterial pressure or volume depletion, which tend to decrease GFR. In these circumstances, the increased level of angiotensin II, by constricting efferent arterioles, helps prevent decreases in glomerular hydrostatic pressure and GFR; at the same time, though, the reduction in renal blood flow caused by efferent arteriolar constriction contributes to decreased flow through the peritubular capillaries, which in turn increases reabsorption of sodium and water, as discussed in Chapter 27.
detail later in this chapter." Guys, if you check brs the correct answer is D but in kaplan it will be C, logically it's should be D.. I AM CONFUSED WITH THIS. I know you guys posted this info years ago, but for you or anyone who might still be interested in the answer. It's in definitively D.
The logic that you guys used to figure out that the slight decrease (according to Kaplan) in GFR causes an increase in FF has been scientifically observed and proven through research. Here is the article link (which also links to source research that contains the information). "The observation that Ang II increases the filtration fraction..."
Thank you to everyone above for sharing your knowledge! D. they are talking about constriction at the efferent arterioles.